In a few weeks four UniLu youth plus Cheryl Summers and I will be heading to the ELCA Youth Gathering in Houston, Texas. One of the presenters will be Bryan Stevenson, an attorney who has dedicated his life to helping people. 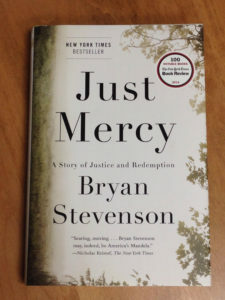 I just finished reading his book “Just Mercy” which is quite compelling. His decades long service also reminded me of the parable from this coming Sunday, that of the tiny mustard seed that “grows into the greatest of shrubs” (Mark 4:32). You may have also heard of Bryan Stevenson’s work through Equal Justice Initiative (https://eji.org/) and the recent opening of The Legacy Museum: From Slavery to Mass Incarceration and the National Memorial for Peace and Justice https://museumandmemorial.eji.org/. It is my hope to take a trip to the memorial and the museum. Please let me know if you are interested in coming along.